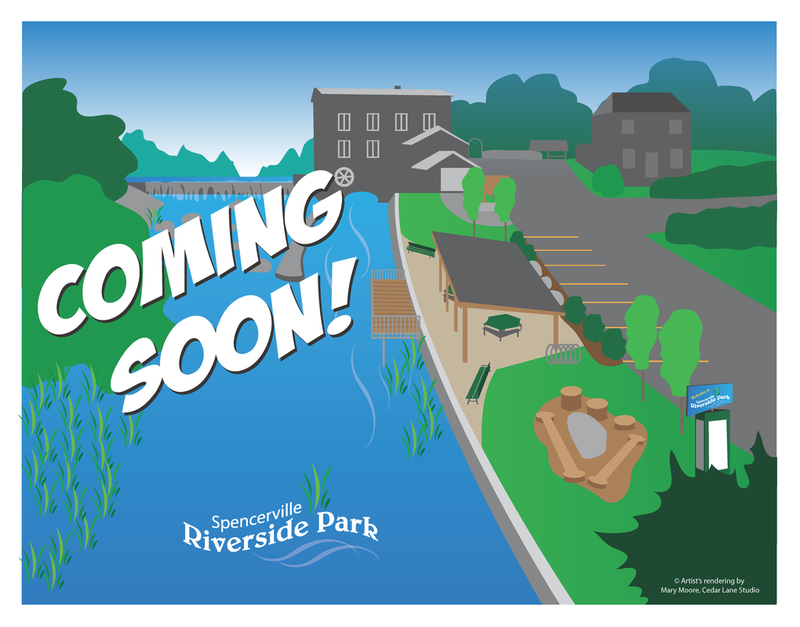 SPENCERVILLE RIVERSIDE PARK … WE’RE almost DONE ! After a great community effort, Spencerville village raised $25,394 for this new park making us the 1st Place national winner in the online This Place Matters Small Project category – we won $30,000 in prize money. The prize money plus dollars raised meant $55,000 to make the Riverside Park happen. A parking area, road work and drainage has been complete by EC Township but construction on the visitor, information and play areas starts soon. One of the requirements of our $30,000 prize money is to complete the new park by December 2018 so we're not done yet. There are still many ways to stay involved and help celebrate completion of this special project. Think about getting your family to donate the cost of a bench with your name on it. Contribute to a great new rustic play area for kids – there will be a plaque with donor names on it. Sign up now for the work team -- volunteers are needed. High School kids can earn some Community Service hours. The location is beside the South Nation River close to the historic Spencerville Mill & Museum. The Mill will benefit from this welcoming new space but so will local businesses, farms, other historic sites, and arts & crafts studios which will be highlighted in an Information Kiosk. The park will include a pergola with picnic tables, a fishing dock, a walkway along the river, trees and shrubs, a rustic play area made with natural materials only, park benches, recycling bins and an Information Kiosk highlighting Spencerville businesses and other attractions of our charming heritage village. We will transform an unused and neglected area into a vibrant green place for locals and visitors. Riverside Park will be a welcoming centre as visitors enter Spencerville and stop for gas, coffee or a rest.